To produce the best quality of work, aim to spend as much time as possible in quadrant II. 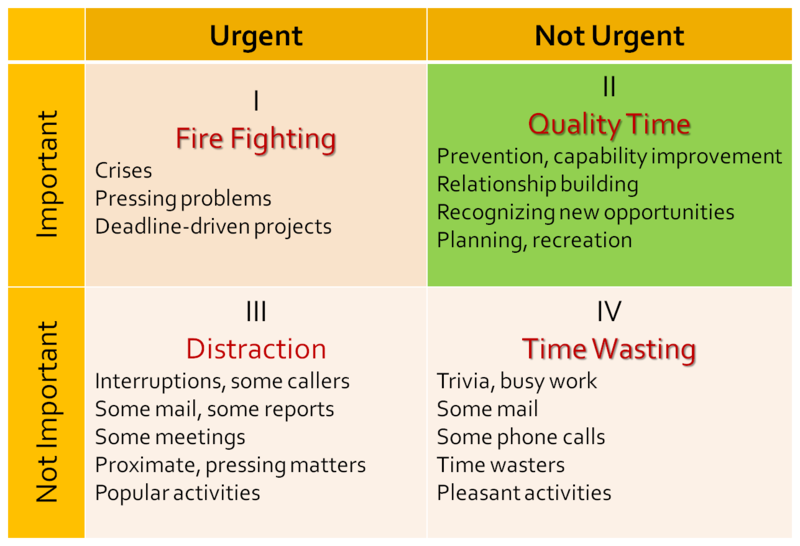 Quadrant II includes those things that are important to your career and program because they are impactful, yet have not reached a stage of urgency because you’ve planned ahead to allow for meaningful thought and attention for such projects. Effective: County Events is in February, and I will work towards County Events from August-February. September- Coordinate workshop at 4-H Kickoff “Sharing Your Project Through County Events.” Include a tip sheet on how to share project work at County Events with all project books distributed. October- Coordinate workshop at 4-H Leaders’ Meeting on assisting 4-H’ers with County Events. November- Organize 4-H County Council to provide County Events workshop for 4-H’ers on an early release day from school. January- Organize 4-H County Council to coordinate critique sessions for youth preparing for 4-H County Events.